MOM stands for Minutes of Meeting and is used to record details of a meeting. 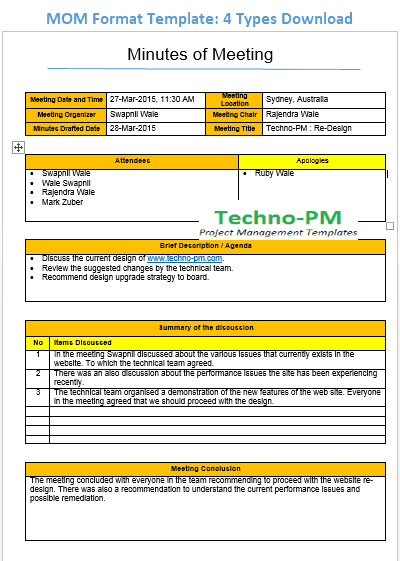 The MOM captures all the details related to a meeting in a single document so that anyone can refer to it at a later time and understand what actually happened in the meeting. A MOM format is a style or pattern in which minutes of meeting are captured. The format can be generic or specific to the company. Typically, MS Word is the preferred tool to capture a MOM. 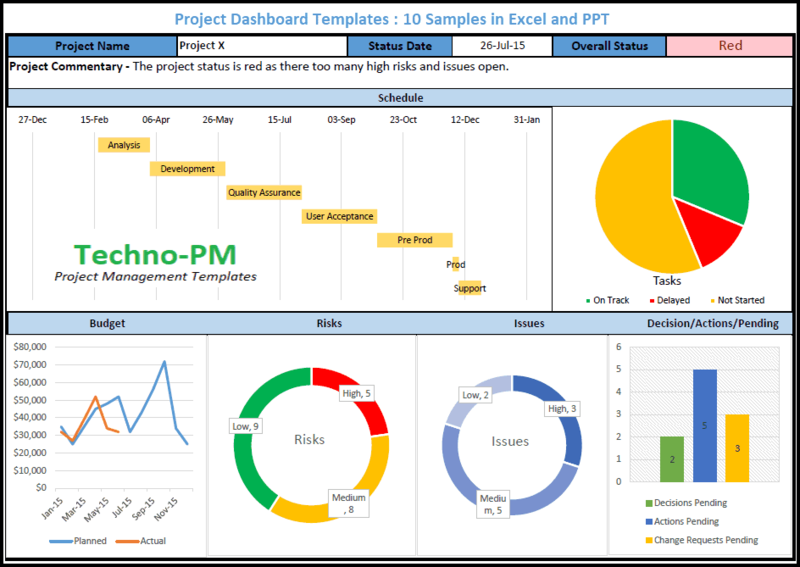 Other formats can include Excel, PowerPoint and in some cases an Outlook or email. What should a MOM Format contain? The first section in the template has details which are more general in nature. Most of the fields are self-explanatory. Meeting chair is the person who is the key decision maker. Meeting title is a short description of the meeting. Attendees are a list of the people who attended the meeting and apologies is used to document people who did not attend. The Agenda should contain the key discussion points for the meeting. It should be a set of bullet points describing what are the different topics that were planned to be discussed. The agenda should be set before the meeting is organized so you can use the agenda that you sent when you organized the meeting. The Summary of the discussion should contain a clear list of points which were discussed with specific names so that it is clear who said what. Summary of the discussion is the key section as most of what was discussed will be captured in the section. So, you should add as much details as you can. The meeting conclusion in the MOM template should contain a quick summary of what was the conclusion of the meeting. If two different topics were discussed then you can have bullet points to discuss both the topics. 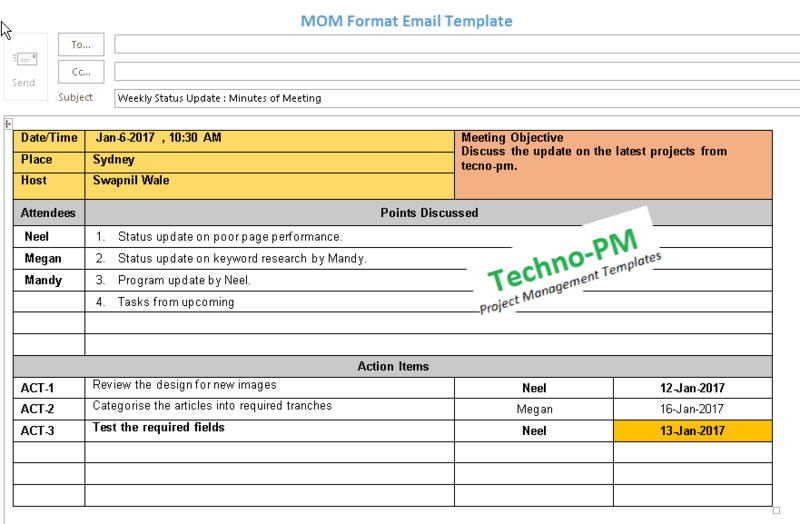 This section in the MOM template helps in keeping track of the tasks that were agreed in the meeting. If you do not need the decisions sections then you can delete that from the template. It is highly recommended that you leave the action items. 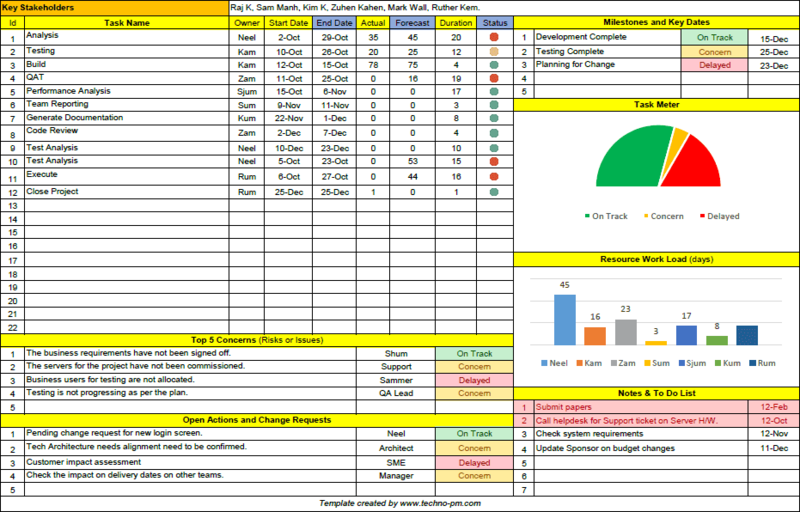 The action items section is also one of the key sections in the MOM template as it captures what tasks or actions are pending. 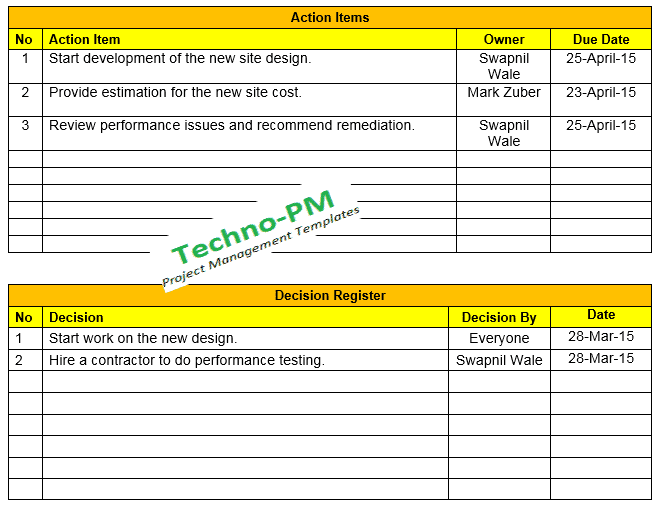 Assigning action items is very effective as each action item will have an owner and deadline. Every Action will have a Serial Number - a counter, Action Item - what is the task, Owner - who is responsible for the task, Due Date - the deadline for the task. It is important to keep the action items rolling which means the action items are published until they are closed. 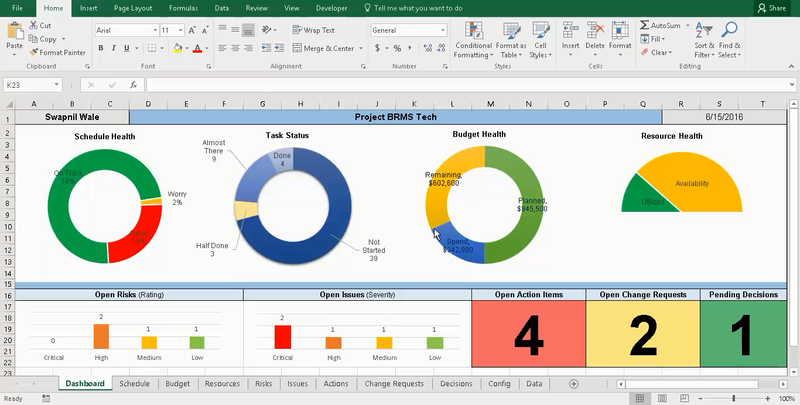 Even after closing, I would suggest keeping the closed action item in the document with closed status for at least one meeting so that people will know when something is closed. 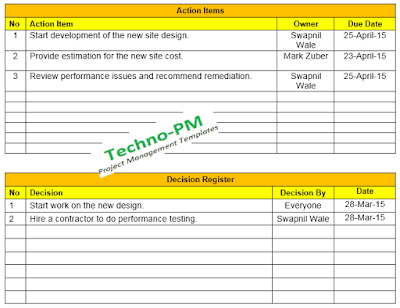 Like the action items register the decision register captures decisions made in a meeting. Each decision contains a Serial Number - a counter, Decision - a description of the decision made, Decision By - who made the decision, Date - the date on which the decision was made. The decision register should also be rolling and should be kept in the minutes as long as possible as people need to know what decisions were made and by whom. PPT also provides ease of creating a MOM format. 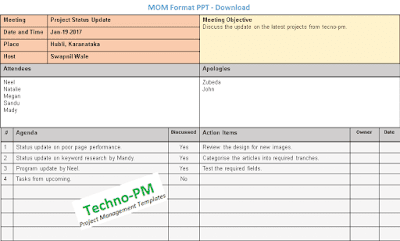 Out MOM PPT template captures the following details. Basic information about the meeting like meeting name, date, time, place and host. Meeting objective covers the reason behind having this meeting. It can be a short summary to indicate what is the reason behind the meeting. Attendees and apologies have the list of people attended and not attended. Agenda is a list of agenda items which need to be discussed in the meeting. There is a discussed column for you to mark when the item is discussed. Action items have the actual description, owner and due date for that action item. Sending minutes via email is not recommended but this is an option that can be used. This template is very basic and covers all the details. But at the same time has been designed to easily fit into an email. You can send minutes via email when it is not a formal meeting which involves senior stakeholders. One of the disadvantages of using email MOM format is that you cannot store like you store documents. 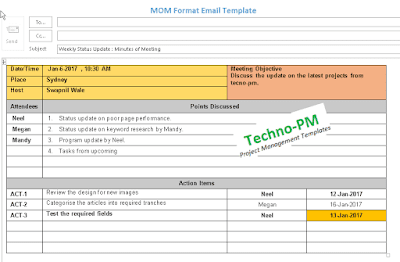 To use the MOM template simply open the .msg template with outlook. While you can always use the readily available MOM templates it can be sometimes necessary to create your own. Depending on the need of your project you may want to create a customer MOM which will help you. Please follow the below steps to create your own format. Step 1: Pick your MOM format or doctype - Understand what kind of document you want to use Excel, Word, PPT or simple email template. Step 3: Based on the content divide the sections of the document into different categories. Depending on the tool being used how you create the section changes. For example, in word and PPT you will have to use tables whereas in Excel you will need to merge the cells to create blocks. Step 4: Depending on your choice color the headings. Typically, as minutes are a very formal document the colors are light.